Thanks to our amazing donors and supporters, GYC celebrated its 35th year with an impressive list of accomplishments. After almost a decade of work by GYC and our partners, the East Rosebud Wild & Scenic Rivers Act was passed. It became the first new permanently protected Wild & Scenic river in Montana since 1976. Following up on this important achievement, then Secretary of the Interior Ryan Zinke signed a 20-year administrative mineral withdrawal in October, protecting 30,000 acres of public lands in Yellowstone’s northern gateway from two proposed gold mines. Now, we’re working to make it permanent in Congress by passing the Yellowstone Gateway Protection Act. With Park County Environmental Council, we also successfully challenged Lucky Mineral’s exploration permit near Yellowstone’s northern gateway in Montana District Court. Our next step will be to challenge the constitutionality of the 2011 Montana legislature’s weakening of the Montana Environmental Policy Act. A victory here could be a major win for the environment statewide. On the wildlife front, our work to protect and improve wildlife migration corridors moved forward with advocacy for new highway crossings in Idaho and Wyoming, wildlife friendly fencing, co-sponsoring the Montana Transportation and Wildlife Summit, and organizing support for key public and private land protections. In a big step toward reducing human conflicts with grizzly bears, our 5-year partnership with the Forest Service to bear-proof all 164 of the agency’s public campgrounds in the region successfully wrapped up. With that important work complete, a new partnership with the Forest Service has been launched that focuses on improving grizzly bear habitat by rehabbing closed roads on public lands. In southwest Montana, our work as part of the Gallatin Forest Partnership paid off as we solidified a proposal that would protect 250,000 acres of the Gallatin Range. It has now been submitted to the Custer Gallatin National Forest and is in the mix of alternatives being considered in the forthcoming Custer Gallatin National Forest Plan. We also submitted a proposal for protecting 645 river miles by designating them as eligible Wild and Scenic Rivers. We helped bear-proof the Park County Regional Landfill just outside Cody, Wyoming with 9,000 feet of electric fencing. The Wyoming Game and Fish Department recognized the need to keep bears out of this landfill and GYC, along with Park County, the Bureau of Land Management, Wyoming Outdoorsmen, and the Western Bear Foundation, signed on quickly and completed this $28,000 project to keep bears from feeding on human garbage. Partnering with Montana State University we held a very successful conservation and recreation symposium, “Our Shared Place,” with more than 250 attendants and Montana Governor Steve Bullock as our keynote speaker. We completed the recreation inventory for the Greater Yellowstone Ecosystem, which has been shared with the public land management agencies and been presented as several scientific and agency forums. Wyoming passed two wildlife friendly GYC-supported bills in 2018, a wildlife license plate with proceeds to fund wildlife migration work and a resolution to look at ways to fund migration protections through Yellowstone National Park admission fees. 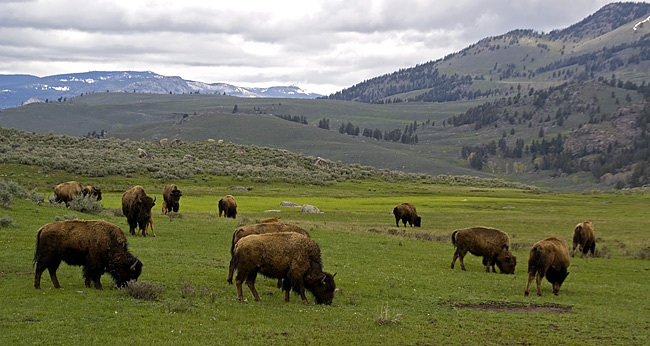 Additionally, Yellowstone National Park approved a bison quarantine program, with a goal of restoring disease-free bison back to appropriate tribal and public lands. We’re working to keep this vision moving forward. And near the end of the year, we responded quickly to the threat of an open-pit, cyanide-heap-leach gold mine on the Idaho side of the Centennial Mountains. With the Idaho Conservation League, we challenged the Forest Service’s exploration permit granted to a foreign gold mining company, Otis Gold. We successfully reorganized to grow our leadership team and all staff capacity in concert with our organizational growth. We also opened our Lander, WY Office, staffed by our Conservation Director Siva Sundaresan, and once again made Outside Magazine’s Top 100 Places to Work. And equally important, we established a Diversity, Equity & Inclusion Committee and are starting on a path of training, awareness, and change. We continue to make significant strides in our work both as an organization and as part of a larger conservation movement. Your contributions make a lasting impact toward preserving the wildness of Greater Yellowstone. Thank you for helping protect the wild heart of North America. Older PostSecure safe highways for drivers and wildlife on Targhee Pass!